©UNICEF/Syria 2015/ Khaled*- Little Hala -11 months old at the time-, after receiving vaccinations for the first time in her life. Like many other dropped-out children in her village Al- Bareesha in rural Harem, Hala was discovered by a mobile team while conducting door-to-door visits to vaccinate children under the age of 5 years. Idleb, 17 November, 2015- As the sixteenth nationwide polio immunization campaign concludes aiming to reach three million children in Syria, the north-western governorate of Idleb was one of the focus areas of the campaign. Active conflict and insecurity has been limiting access to services including vaccines and healthcare, making Idleb one of the most hard-to-reach areas in Syria. “We face many difficulties,” said Sanabel Al- Qassier, Health and Nutrition Officer at UNICEF. 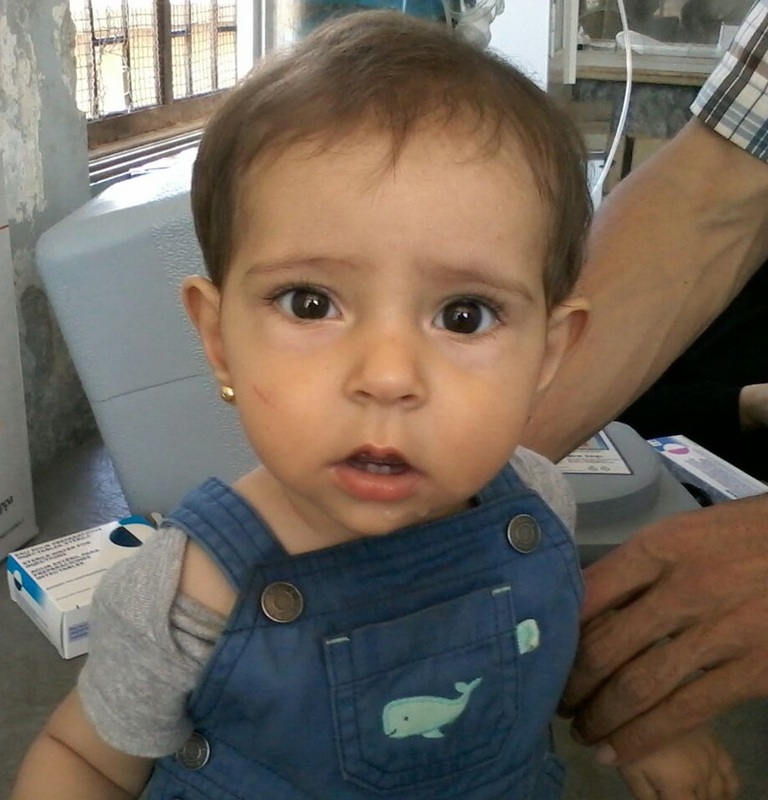 “The increasing violence, deteriorating security situation and logistical challenges make it hard to transfer vaccines to areas like Idleb,” she explained. Another difficulty noted by health workers in Idleb is the parents’ misperceptions regarding the safety of the vaccines. “Following last year’s tragedy, when a human error during the administration of a measles vaccination killed 15 children in Al Jarjanaz town in Idleb, it became very difficult to convince parents of the importance and safety of vaccinations,” recounts Khaled*, a health worker involved in the campaign. Despite these hurdles, UNICEF and its network of partners are providing support so that children in places like Idleb can be protected from preventable childhood diseases such as Polio, Hepatitis and Measles. “It takes a lot of effort, and an army of community health volunteers to change attitudes and save the lives of children,” says Khaled. “The damage to medical facilities, insecurity and lack of sufficient clean drinking water and proper nutrition has caused many children in the governorate to be prone to epidemic diseases.” Al- Qassier noted, explaining the importance of immunization campaigns. “Strengthening routine Immunization efforts and reaching children who have dropped out is the only way to avoid another Polio outbreak and other life-threatening diseases,” she added. The immunization campaigns extend all year long and rely on mobile teams of health workers and community health volunteers who carry out door-to-door visits in the most no-go areas of the governorate, to vaccinate children under 5 years of age against diseases. ©UNICEF/ Syria 2015/ Khaled*- A little girl receiving vaccination against Polio at her home in Al- Balmees village in Gisr Al- Shoghoor. 14 -month old Hala had never been vaccinated until a UNICEF-supported mobile team found her during the door-to door immunization campaign at her home in Idleb’s rural Harem this past July. During the same campaign, a mobile team succeeded in convincing families in the town of Jarjanaz and its surroundings to vaccinate their children despite of the infamous incident. “We no longer trusted the vaccines, I thought to myself; if he survives violence on the way to the medical centre, he will get killed by the vaccines.” said Adle, explaining why her 3 year old son Aws, was completely dropped out till past July. Hala and Aws were immunized thanks to the efforts of the brave health workers and volunteers, who risk their lives to vaccinate children. However, it is estimated that over 4,000 children in Idleb continue to miss out –either partially or fully- on life-saving vaccinations due to lack of access. 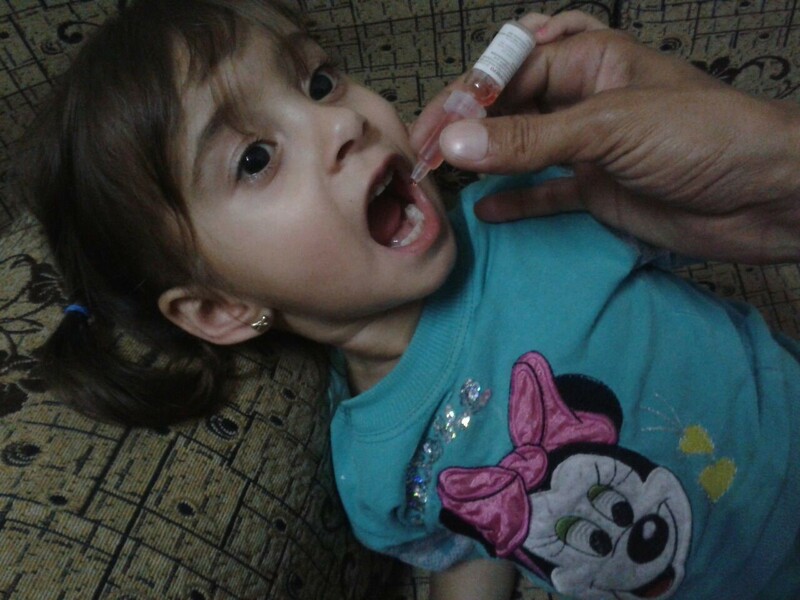 Syria has been undertaking regular nationwide polio immunization campaigns as part of a comprehensive response to the polio outbreak in October 2013. Fifteen mass vaccination campaigns reaching on average 2.9 million children each round were carried out since. No new polio cases have been reported since January 2014. The campaigns are jointly organized by the Ministry of Health, UNICEF, the World Health Organization and local partners including the Syrian Arab Red Crescent. Tagged #childrenofSyria, Polio, supplies, Syria, Syrian crisis, Vaccination.